Pale pink rosé from Provence is bankable. In order to be bankable right now, Provence producers are obliged to turn out rosé that is a pale steel pink. Colour is all. The boom. U.S. consumption of rosé from three appellations in Provence skyrocketed tenfold between 2010 and 2016. These appellations are located in the French départements of the Var and the Bouches-du-Rhône in Southeastern France: AOC Côtes de Provence, AOC Coteaux d’Aix-en-Provence and AOC Coteaux Varois en Provence. In 2017, Provence rosé sales in the U.S. jumped by an astonishing 40%, with the U.S. now accounting for 50% of Provence export by volume. The U.S. is not unique in the rosé explosion. Last year, imports of Provence rosé were up by 29% in the U.K. In France today, rosés represent 30% of wine purchases, compared to 16% in 2002. It was a double punch – a knock out. First, in late-April of 2017, a severe frost hit the vineyards in southern France. I know of one wine grower who lost 75% of his crop to the freeze. Then, an intense summer drought never relinquished its grip. Light rains in late August or early September that growers bank on never arrived. The first harvests began 10 to 15 days earlier than usual. The French Ministry of Agriculture reported a 23% decline in production from 2016 in Southern France. In early March, the CIVP (Le Conseil Interprofessionnel des Vins de Provence) announced a 12% decline in production of Provence wines for the 2017 harvest. It is expected that the thirst for rosé may well outstrip collective supply this year in Provence’s prime export markets – the United States, Germany and the U.K.
Provence rosé is decorator-friendly – a pale steel pink that evokes a blissful moment. It is hip in ways that flatter the drinker. Fresh, light and dry on the palate, it has a balance of acidity and enticing white fruits and strawberry, along with a hint of minerality. The emphasis of brand image lies in “style,” rather than place and terroir (tair-wahr), the distinctive character of a particular vineyard, such as its soil, elevation and microclimate. The Provence rosés rely upon process, the use of advanced technology: gentle presses (Inertys systems) and tanks with heat-exchange coils for cool fermentation. These Provençal rosés are brands produced on a large scale by négociants who purchase grapes or juice from unidentified growers. From an aesthetic standpoint, Provençal rosés are a technological, industrial product, more like perfume, computers and sneakers, than the work of an artisan. The Provence-style rosés ushered in a shift in the way Americans looked at rosés, with a new lexicon that emphasized colour. The paler the rosé the better, some Provence producers say, conflating colour with quality. It is a way of managing one’s perceptions of rosé as well as pre-articulating taste. A négociant purchases juice or grapes from growers, and then bottles the wine under their own brand. The growers are not identified. These wines are not biodynamic nor organic, and the actual percentage of each grape variety in the blend is usually not provided. 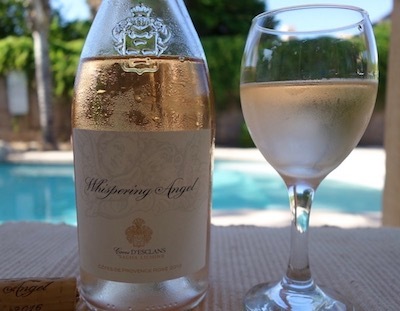 The top selling Provence rosé is Whispering Angel (a brand from Chateau d’Esclans), which is wildly poured in South Beach, New York City, and in the Hamptons. The 800,000 cases shipped by Sacha Lichine of Chateau d’Esclans represent 20% of all Provence rosé sold in the U.S., and 25% of their value. Other major négociants are Miraval (Jolie-Pitt), M de Minuty (Minuty), Ott by Ott (Domaines Ott), and Pure and Étoile (Mirabeau en Provence). These négociants are active on social media as well as engaging in promotional campaigns and tastings for their respective brands. These rosés are premium brands, selling for more than $15 a bottle, with several in the $20-$27 range. Rosétainment is a social proposition endorsed by a certain tribe that I would label the emerging sophisticated classes, or the pre-rich. Millennials, who are twice as likely to purchase rosé as Baby Boomers, are the welcoming targets of rosé producers who flood chic events, summer soirées and festivals with their liquid pink. The cosmopolitan settings are concentrated in Metropolitan New York area and Miami, where 25% and 15% of all imported rosé is consumed, respectively. For this tribe, beyond an insouciant buzz, rosé is a serum against social decline. Whispering Angel is marketed as some hip sophistication. Chic promotional events are the natural habitat for Whispering Angel’s vivacious coltish models in pretty dresses, who Sacha Lichine says are “the best agents for the brand. For the perky females, a glass of Whispering Angel is a fashion accessory. Whether consumed or not, a glass of rosé in hand announces your sociability. Among Whispering Angel’s festive PR repertoire are rosé-infused Sugarfina gummy bears, yacht and pool parties, the Nantucket Wine and Food Festival, and a rosé-drenched reality show on Bravo: Summer House. Bare flesh? A quick scan through the Twitter posts of Miraval reveals thinly-clad maidens appearing incurious of their extant surroundings – a beach, a pool, a dressing room – other than an ostentatious bottle, often open and sans a glass. Miraval women have the look of people who create an envelope of privacy around themselves just by their expressions – vacuous looks and pensive poses. The visual code: self-sufficiency. Although she has adopted children and even countries, Angelina Jolie embracing these desultory images would surprise me. She has always seemed to keep a half-a-world away from the wine biz. I take it that the overlush bottle makes a diabolically seductive promise of vinous pleasure to those fetishistic devotees thirsting for psychic intimacy with Jolie and Pitt, now working out a divorce. There were some growers in Provence who were reluctant to report reduced production from the 2017 harvest because they feared that news would dampen demand from importers. With reduced production, it is unfathomable for Provence rosés to expect a double-digit sales increase in 2018 that has been routine in the U.S. during the past decade. For all producers, it was a very tough year on the supply side. The leading négociants were able to leverage long standing relationships with growers and their financial resources to access the volume they required. Some of the big négociants paid way over the usual level to secure volume, which made harvest time extremely stressful for négociants and growers. For smaller producers, there were no solutions expect to accept lower production. There was a higher price to pay for grapes that threatens to cut into margins. Yet, producers strove to mitigate price increases to insure that they protect their customer base. Clos de L’Ours in Cotignac lost up to 70% of its crop, but was rescued from disaster by a local farmer. In Flassans-sur-Issole, the Commanderie de Peyrassol suffered a 50% crop failure for its Cotes de Provence rosé. The owners were able to join with four other growers to augment their production. In other renowned appellations, the estates that vinify organic grapes grown on their vineyards have no option to secure grapes for their single vineyard vintages. 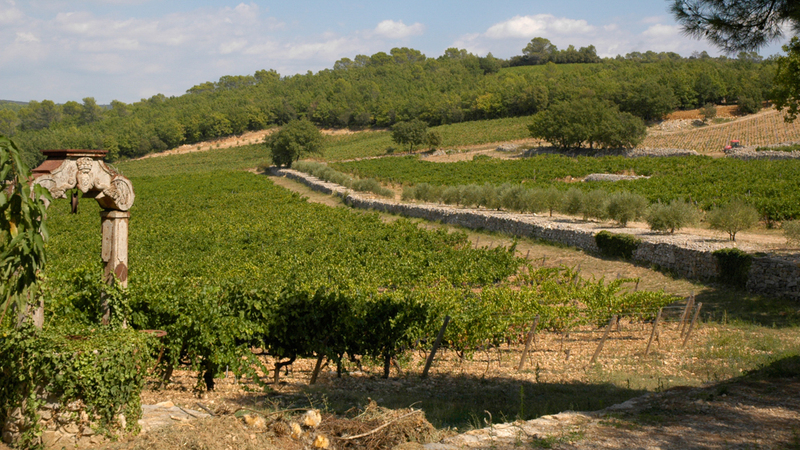 As the brand image of Provence rosé is driven by distinguished brands, not estates, négociants are able to expand their buying programs to source grapes from countless growers. The result: these négociants — d’Esclans, Miraval, Minuty, Ott and Mirabeau — are able to maintain brand mystique even in a year when production is crimped by an uncommonly poor harvest. By doing so, there is a spillover benefit to all Provence producers who share in a vibrant brand mystique. 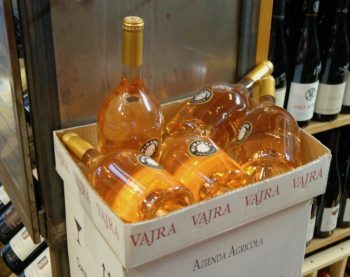 For party planners in the Hamptons this summer, wise counsel is to buy your stock of rosé early in the season. 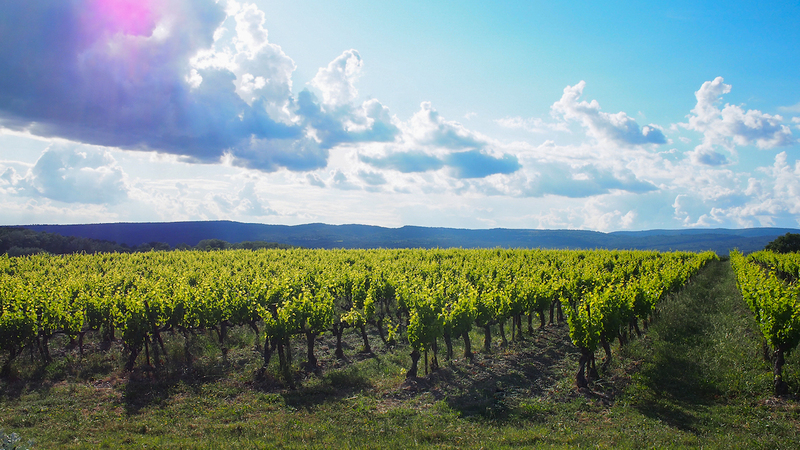 In Provence, growers are reporting early spring rains that are moistening the soils. A bumper crop? Pourquoi pas? La Revue du Vin de France conducted a blind tasting by its experts of 120 rosés from the Provence appellations. These AOC’s do not include Tavel nor the wines from the Côtes du Rhone. The panel of tasters employed a 20 point rating system. The top 50 rosés fell into 13.0 to 17.5 range. This list includes all cuvées with a 15.5 rating and higher. La Revue took a unique approach of categorizing the Provence rosés by color (robe): pale rosés, intermediate color, and intense color (haut en couleur). Here are the top rosés by property, cuvée, and rating along with those that are certified “Bio.” All are 2017 vintage, unless noted as 2016. The majority of Provence rosés are pale, made by direct pressing or a few hours of cold maceration before pressing. Note: The other 19 pale rosés were rated 14.5 and below. 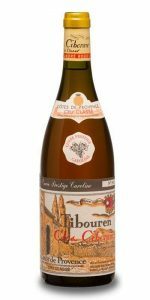 Whispering Angel from Caves D’Esclans was rated 14.0, in 31st place with 13 other cuvées. Neither displaying pale nor intense colors, these rosés feature red brick, orange, or light brown tones. These rosés display a bright color. Intense and well-structured, they are rich in fruit with an occasional spiciness. « Bandol Rosé is a Flat Out Exquisite Antidote to Paleness. Think Mourvèdre.